Charlie’s Paradise is on schedule to follow the Longfellow project. It has been underway for a long time but is presently in an intermediate stage. As does happen to my personal passion projects from time to time, it has been interrupted by other “contracted” projects. Contract projects are typically – though not always – the passion of a third party – like a network, producer, publisher or another type of client. 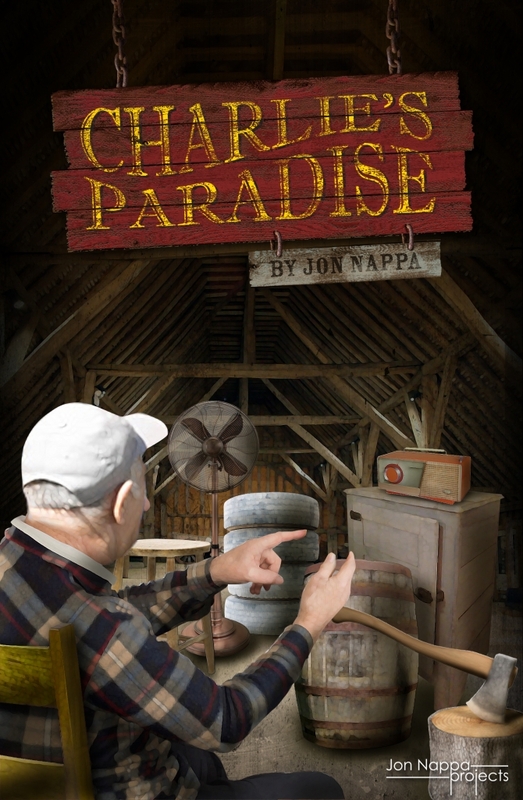 I enjoy that kind of work but Charlie’s Paradise is a personal passion project. When it does publish, it will be found to be an adult dramatic fiction with an element of the fantastic. It’s about regret and the revising of one’s life as part of an arduous and complex journey toward forgiving oneself and discovering renewed purpose. It is about Charlie Clark and the transformation from tormented soul to enlightened man. In his inspiring wake, he attracts a depressed college professor with a heart full of broken dreams and a classroom of students who don’t know as much as they think they do, but are amazed to discover they possess more than they ever suspected. While riding home in the backseat of my father’s car from Highland Forest in Upstate NY in the late 1970s, I found myself staring out the car window counting fence posts. At some point, my gaze drifted across a field to the front porch of a decrepit farmhouse. An old man sat in his rocking chair puffing on his pipe and rocking slow. His stare appeared aimed upwards and I imagined his thoughts to be somewhere else, perhaps millions of miles away or perchance revisiting some bygone era or exploring some other dimension in time and space. I wondered where he might be. I wondered about it for years until it became a muse that insists even now that it will never leave me alone until I complete this tale. ‘Chawlie’ was how he pronounced it. His grin was slight but his grip firm and his head bobbed like a squirrel ready to leap. Then he let go, turned away and forgot I was there. Nobody understood him and neither did I and he knew it. He forgot I was there because he didn’t want me there. He didn’t want anyone there. No one except those old guys. Tree stumps really. Well, one tree stump relieved of its grip of the earth and leaning loose in a circle of items in the middle of his garage. It was a detached garage, a carriage barn years ago, and it made me think that’s who Charlie was—an old man who had since detached from the world. The other old guy was an empty oil drum and, well, every imaginable item of junk one could expect to find in an old barn, each of them representing an old guy and they were arranged in a circle. Word had gotten around that Charlie sat among the circle on a chair in deep conversation with a flattened inner tube, a splitting maul, the old stump, and whatever else huddled with him. I say ‘word had gotten around’ because I was the one who had got it around. I regretted it for a time but came to see the unintended beauty of it. I could never claim it was intentional. Sometimes we do something good we never intended but that’s nearly the opposite of what I learned from Charlie, but then we’re getting ahead and we really shouldn’t do that because, well, this isn’t going be like anything you ever heard before, I’m sure. Charlie would sit in the circle and nod like he was listening and then talk for great lengths of time about the sun and the stars, the problem with mankind and at least one time, something about emulsion polymer flocculants. Least that’s what I thought I heard him say. It wasn’t easy listening from the loft but I had to know for sure what it was all about. I’d seen him from my classroom window, marching along the athletic field at the end that borders the beach and he never failed to distract more than a few of my classes. Despite my students ignoring my instructions to ignore the local oddity, I was unwilling to draw the blinds especially on sunny days since there’s no sense having a college campus on the New England coast of Portland if you’re not going to enjoy the view, so it was either ask the campus police to check this guy out and see what could be done, or do something less formal, if a little more invasive, on my own. It was one particular Saturday morning when I sneaked into his space and sure enough he entered the garage at around the same time he had been entering during the weekdays when my classes were in session. He sat right down in the midst of an odd gathering of junk. Later, I googled the phrase, ‘emulsion polymer flocculants’. I had heard it right. It was some kind of chemical used in waste water treatment. Eats it right up. Yup, it was like they had said. Charlie Clark was crazy, minus a cylinder or two, for sure. Charlie had been a genius. That was the rumor at the time anyhow. Engineer. Secret sort of stuff for the feds, I guess. Real hush-hush. That’s the first thing I confirmed through a little research and that surprised me about him, beyond his odd behaviors. You’ve got to admit there is something intriguing about crazy folk. You wonder what it is they know so well that makes them crazy or if maybe they don’t know anything at all and that’s where the craziness started. But funny? Charlie could make you laugh he was so darn weird. Running around our campus athletic field with a hoe in his hand shouting curses to someone or something as if villainy had shown up right then and there to accost him or his wife. It was plain and simple crazy. His wife. Now there was a sweet example of what a grandma ought to be. I remember she seemed old long ago and then never got older, just stayed the same old until she died. I’d been teaching at the community college for almost twelve years. It was to be my vocational wind-down before retirement and over all that period I never saw her in anything but one dress or maybe she had two or three of the same kind. Gray with little blue flowers and she packed it out with rolls of flesh, mammoth breasts with only her thick neck, club calves and soft hands the only flesh you’d ever see. But grin? That woman had a smile that proved there was at least one grandma alive who loved all the little children in the world. She’d rock on the porch, Charlie right beside her in his rocker, until time to bake or cook or clean, I imagine. Charlie, he’d be a million miles away, staring into space remembering something or trying to forget maybe, but Carmella, she’d be grinning and rocking and making melody in her heart. She handed me a piece of hard candy every time I swung by on my way home to my flat. She didn’t have any pockets and I never saw her with a purse but she’d produce that little wrapper of sugary delight every time. I knew it wasn’t magic even though it seemed like it was, cause I’d also see her walking down the road coming back from the corner grocery – nearly three blocks distance – carrying two or three large bags of food and stuff. You’d never believe she was going to make it, but she always did. I figured if she was magic she wouldn’t suffer that kind of haul. I’d help her now and again, if I happened to be on the road while she was, removing one bag of her burden, because she wouldn’t let me take more than one, no matter how much I insisted. Charlie never went shopping with her so far as I could tell but she loved him and he cried like a lost child when she died. I think that’s when the craziness really got stranger. She must have been some kind of force in his life that kept it in check. He mumbled a bitter lament about the pillow talk he used to know like it was a kind of medicine they didn’t make anymore. Then he’d cry. More and more he withdrew and finally never rocked on the porch anymore. At first, I thought maybe the craziness was going to disappear because for a time he ceased from his daily marches at the edge of the field along the shore. Used to be he’d march back and forth for nearly an hour a day with a garden hoe held upright against his chest and over his shoulder like a rifle. It was as if he imagined himself on patrol. It was fodder for mockery and all kinds of not so nice comments from my students. What could you say? It was peculiar to say the least. But he had stopped such marches—for a time. He had disappeared for a long season before someone finally figured out he was spending all sorts of time in that detached garage of his. The shrubbery around his porch and along the picket in front and around the side facing the campus from across the field, had become overgrown and unsightly, but someone noticed his new pattern. Instead of a march to the sea with his hoe in place, he lumbered to the garage, sometimes holding the door open and waving others to join him inside only there weren’t any others. So, I spied and found out. I tried to connect with him some – and I was hoping maybe – well, he was my neighbor, sort of, and well, it seemed a neighborly thing to do and I was plain and simple curious. It was clear he didn’t want me there and he barely recalled who I was, even stated his name each and every time I stopped by, and shook my hand like we’d only just met. He would have recognized me better if I still shaved I guess but I was trying a few change-ups in my own life and the beard seemed like something to try out. Many of my fellow professors had beards and though I had resisted until now, I was curious what I’d look like with it all grown in. Life goes on and at some point you admit you’re getting older. I guess it was the reality that my beard was growing both black and gray that I had for a while resisted the typical professorial appearance, but now it seemed worth a try. How do you know unless you try? At fifty years old, it might make me feel smarter or wiser or maybe I’d even begin acting my age, although I wasn’t really convinced of any of that. I could always reverse the decision in one morning if I chickened out. Life moves on. I guess. For everyone but Charlie, I mean. At the time, I didn’t know exactly where it had gone for him. He had begun running around the athletic field in a new way, like a psycho, swinging his hoe like he was batting cleanup. This was way more distracting than his border patrols and he seemed to do it right in the middle of my best lectures. I laughed at first, amazed he could get even stranger than he had been, but as it went on, I felt sorry for a long time until it just became funny again. I mean what else could you do, but laugh? I mean, it’s crazy what he did. And for me, well nothing much was happening anywhere in the world really half as interesting as Charlie during that particular year and my lectures, well, what the hell, I had given them so many times and to be honest, I wasn’t sure if I was helping anybody with what I had. So I snooped. I’m telling you, the guy was a hoot. But that isn’t telling you the half of it. Be careful what you snoop for. It could plain and simple swallow you whole.